The Secretary General of the Council of Ministers received Dr. Mehdi Alalak, the development consultant at the Swedish Agency for Development (SKL), Mr. Gunnar Andersson, discussed the draft proposal proposed by the Swedish Agency for Federal Support and Financial Decentralization in local governments in Iraq, especially in Muthanna and Diwaniyah provinces, which is part of the Swedish-Iraqi cooperation strategy. -2021. 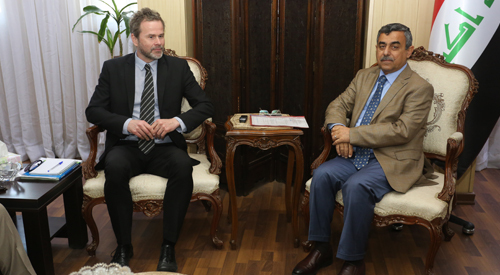 Mr. Andersson expressed the desire of the Swedish Government to deepen the horizons of cooperation by signing the memorandum of understanding on the project in order to support Iraq and achieve tangible and practical improvements in the way of dealing with officials and decision makers, organizations and institutions in the two provinces. He also stressed the importance of providing support in building the capacities and expertise of local government units and raising their skills in the framework of decentralization so that the best system of local government can be designed, inviting them to coordinate with the concerned authorities.